Laser blanking became a reality in the late 1960s when British scientist Dr. Peter Houldcroft was the first to develop a gas-assisted laser capable of cutting steel. Thanks to his pioneering work, the traditional press blanking method finally had a rival – one that promised to one day offer a faster, cheaper production method with cleaner cuts. After decades of improvements, laser blanking is now entering a new age, due in part to relatively recent research and development by LaserCoil Technologies LLC. Two laser heads are better than one; working from coiled stock is more efficient than working with panels. It is with those two concepts that Automatic Feed Co. (AFCO) set out to evaluate, test, prototype and finally bring to reality new technology under the name of LaserCoil Technologies LLC, officially founded in 2011. The three-year feasibility and development research process by AFCO, an innovator of pressroom automation with a nearly 70-year history in the industry, included key team members who now lead LaserCoil. Jay Finn, technical officer and general manager at LaserCoil, has more than three decades of experience in stamping, flat metal lines and metal fabrication, and industrial lasers. Finn has also filed several laser-related patents. The traditional method involves working with predetermined lengths and widths of rectangular pieces, or panels, of material that are fed into the laser work area on the table. After one rectangular piece is processed, another is fed into the machine. The team at LaserCoil wanted to do it differently. Finn and a cross-functional team of associates developed a blanking device that works from a roll, or coil, of material rather than rectangular pieces. The team, going off Finn’s patent, focused first on coiled stock that could be continuously fed into a single-module unit (one laser). They later implemented a second module (Finn received the patent for it in 2010) to increase efficiency, and they are now working on adding a three-module system. When the research began, the team was focused on 1-kW lasers. LaserCoil now sells systems with 6-kW lasers. The multi-module system from LaserCoil has roughly the same footprint as a 208-in. blanking press. The LaserCoil system can achieve a 2.5-m-per-second cut time on 1.0-mm material. One of the processes that separates LaserCoil from other laser-blanking companies is how the material is fed into the cutting area. A series of dynamic profile conveyors support the coil strip and offer a cutting path for the laser heads. Moving dynamically and independently, the lanes are repositioned to offer a clear path below the laser head. This approach allows the coil strip to move through the system without having it pushed back and forth. Simultaneously, all scrap material is gravity shed, leaving a burr-free part, ready to stack at the end of the line. Other systems that use coiled material integrate a special feed and/or stacking solution. LaserCoil users don’t have to purchase anything “special” to work with its technology because everything can be retrofitted to work with existing feeding and stacking lines. The advantage is that LaserCoil users realize more efficient processing and a smaller investment in infrastructure. Press blanking can cause micro fractures. However, laser blanking, as seen in this photo, offers a clean, burr-free edge. LaserCoil’s technology is built to work with materials 0.5 mm thick to 3.5 mm thick and coils up to 2.1 m wide. The system currently cuts 1.0-mm-thick materials at a straight-line rate of 2.5 m per second. Manufacturers can run a variety of materials through the system, including aluminum, mild steel, advanced high-strength steels, and various surface sensitive and pre-painted materials. While the primary industry being served is automotive, the technology is a good match for agriculture, aerospace and other industries. The solution is also meant to be flexible, offering the ability to cut shapes from complex body side outer panels to simple scroll cuts and chevron cuts. Production rates can improve by an average of 85 percent with the multi-modules when compared to the single-module system. The system, however, isn’t for everybody. The laser-blanking speed is tied to the thickness of the material. Traditional presses can blank heavy-gauge materials fairly fast, which is something Finn says lasers (with their current power levels) can’t touch. Despite thickness limitations, laser blanking does have specific advantages over the traditional press. Dies used in press blanking machines are cumbersome, difficult to engineer, and take time to not only develop and fine tune, but to move in and out of the press when a job is switched out. Furthermore, they take up precious space on the shop room floor. Finn says the multiple-head unit is the same size as a 208-in. blanking press. Adding a third module will probably increase that footprint where length is concerned, he says, but there is no die storage to contend with when using lasers. There is also the quality of the finished product to consider. 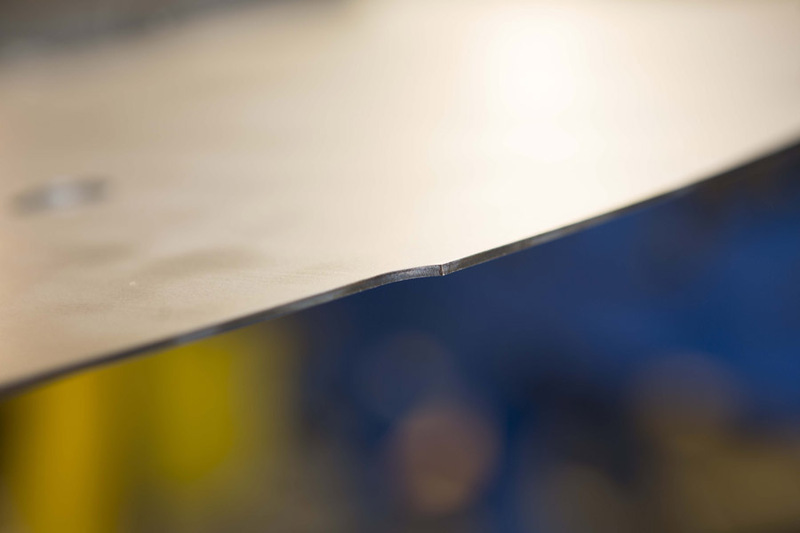 With high-strength steels and ultra-thin materials, press blanking runs into the problem of micro fractures, which propagate and split as parts are formed. This is a situation that doesn’t arise when using lasers. The patent that LaserCoil works from focuses on the dynamic support conveyor lanes for the coil. It offers the most flexible laser-blanking system from coiled stock you can buy, says Finn, because the user can run it in multiple modes. The process is faster than traditional laser-cutting tables. “You can send everything out the end and have robots pick all the good parts out of the coil strip that have been separated by the laser,” Finn says. A frequent compliment LaserCoil receives from customers is that the system they’ve designed “can move out of the way and drop the scrap, so only the good parts come out of the end like regular press blanking would do,” Finn says. This gives them the opportunity to retrofit existing coil equipment and stacking equipment. The laser blanker can be dropped directly into the center of existing equipment. 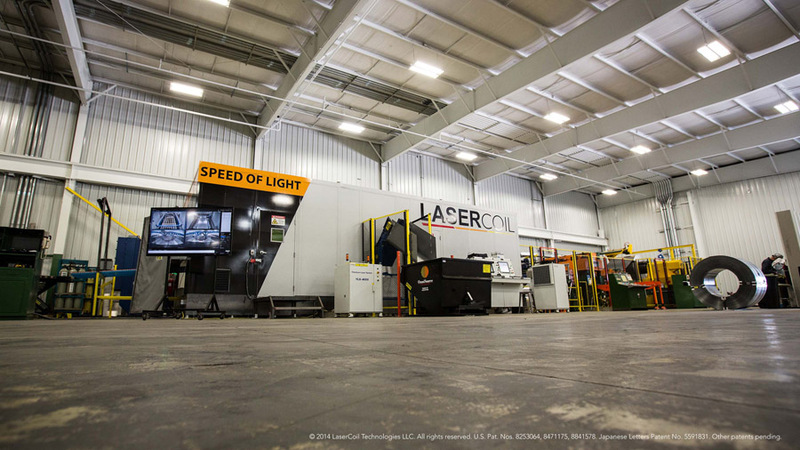 LaserCoil operates out of a 12,000-sq.-ft. technical center in Perrysburg, Ohio. Currently residing in the technical center is a LaserCoil blanking system capable of handling 30-ton coils. The system is used to run prototype parts, test runs and low-volume production. The company also has a massive 130,000-sq.-ft. facility in Napoleon, Ohio, where it handles additional design work and has access to service capabilities, engineering and equipment manufacturing. The company received its first order for a single-head system in 2013. It completed two multiple-head orders in 2014 and launched the first of several customer production lines in 2015.